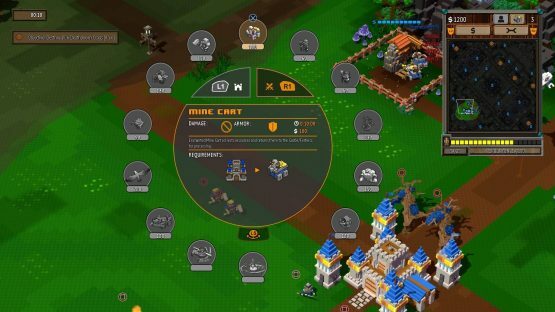 With its colorful and boxy voxel-based aesthetic, 8-Bit Hordes could be the introduction to the real-time strategy (RTS) genre that hooks otherwise uninterested Minecraft fans. It also made the jump to console, so for those among us who game exclusively on PS4, this could likely be an introduction to the RTS genre, one typically seen more in the PC environment. As I jumped into one of two campaigns, I quickly realized that this was my introduction to the RTS as a genre. I’ve had consoles for my entire life, but never owned a PC powerful enough to run new AAA games. I’m a big turn-based tactics fan, so the act of devising a plan of attack and moving troops into position is familiar for me. But, learning to juggle mining and building and attacking was new. It isn’t the series’ introduction to console, though. Developer Petroglyph previously released the first 8-Bit game, 8-Bit Armies, and has the series’ third entry, 8-Bit Invaders, coming to PS4 at the end of the month. So, for those who are just getting acquainted, there’s plenty more where this one came from. But, does 8-Bit Hordes work as an introduction? For Minecraft fans, maybe? There are minecarts, which you, as the God-like commander of either the Lightbringers or the Deathsworn, will send to gather resources from all over the war torn maps. Once the materials have returned to your fortress, you’ll use them to create new units and new structures. If you’ve learned resource management from Mojang, this simplified take may not do much for you. The mysterious material you extract from the ground can be used to build farms, barracks, dwarves, and dragons. This is a departure from Minecraft and, as I understand it, most real-time strategy games: you won’t need different materials to build different things and you won’t be combining distinct compounds to craft something new; like some kind of minable atom, the easilyobtainium that runs in crisscrossing veins beneath the 8-bit earth is the building block comprising everything. That’s not really a negative. 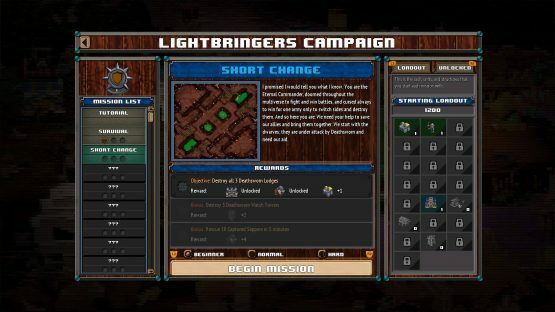 As 8-Bit Hordes may be the first RTS that console-only players get their hands on, the simplified approach works. And, laudably, Petroglyph pretty successfully mapped RTS controls to the Dualshock 4. Pressing R3 brings up a map with six sections you can transport among, making it easy to switch between troops on opposite sides of the map. L1 and R1 bring up structure and unit wheels respectively, and the triggers allow you to fix or scrap your buildings. It all maps pretty neatly and I never felt hamstrung by my lack of a mouse and keyboard. I did, at times, feel hamstrung by the game’s tutorialization. Some of that had to do with presentation; 8-Bit Hordes joins the long list of console games with font so small you would need opera binoculars to read it. When in doubt about a unit’s strengths and weaknesses or the nuances of the tech tree, I was frequently standing up to walk closer to the TV, like Sherlock Holmes with a magnifying glass except the only crime to be solved was the one committed against my eyesight. But, more substantially, the game quickly drops players into the deep end. After a series of painfully slow tutorial missions, 8-Bit Hordes’ campaign instantly ramps up the difficulty with a series of missions that will have the newly initiated banging their heads against the blocky walls. Actually, none of them are all that difficult. Each just has one trick that it requires to learn. If you miss this tell, which sometimes are hinted at in the tiny blocks of text that serve as mission briefing and sometimes aren’t communicated at all, you’ll find yourself outnumbered and outmatched. Maybe Petroglyph is assuming that more experienced players will know what to do. That’s fine, but it doesn’t match up with the heavy-handed tutorialization or the game’s marketing as a beginner-friendly introduction. That said, when those missions click, they really click. Given that each has a tell that you’ll need to discover, they can feel like puzzle boxes demanding a solution. When you find that solution and begin to steamroll the enemy hordes, it can be deeply satisfying. But, it can also quickly become boring. Once you figure out the trick, you’re often just throwing units at your opponents with little regard for strategy. Most missions ended with me walking up to my opponent and attacking their fortress until it fell apart. I didn’t need to flank them or sneak or use any sort of cunning. I just needed to figure out one thing. That’s all the game demands. 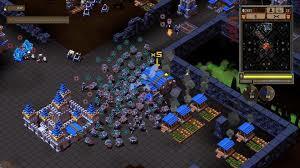 8-Bit Hordes review code provided by publisher. Version 1.0 reviewed on a Standard PS4. For more information on scoring please see our Review Policy.